Pride Auto Body is proud to offer a full range of tire selection services to vehicle owners located in the greater Parshall area. At Pride Auto Body, our tire experts can help you choose the tires that not only best suit your vehicle, but that are designed to best fit your vehicle. Not only will this make your vehicle safer, it will make the vehicle look great and will help you keep fuel costs as low as you possibly can. Selecting the proper tire for your car is important on many levels. When selecting tires for your vehicle, we consider how far you drive, where you drive and even when you drive. there`s more to tire selection than matching a brand name to the make and model of your car, especially if you want tires that last and improve the performance of your car, as well as the look. At Pride Auto Body, we help you select the tire that will give you the best performance for your money. 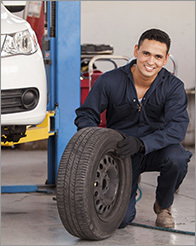 We know how important your vehicle is to you, and we know how important tires are to your vehicle. All information provided is provided for information purposes only and does not constitute a legal contract between Pride Auto Body and any person or entity unless otherwise specified. Information is subject to change without prior notice. Although every reasonable effort is made to present current and accurate information, Pride Auto Body makes no guarantees of any kind.